Plans for Howard University’s proposed mixed-use development project, Howard Town Center, have been dragging on for years. The university is making the tough call to hold out for the ideal project rather than build what it can in this investment climate. Troy Stovall, Howard University’s chief operating officer, revealed Thursday that the difficulty in financing the project is not due to the retail and supermarket component, but due to the number of apartments slated for the site. Rather than letting the developer proceed with building the garage, supermarket, retail shops and half the number of apartments originally planned, Howard wants the full project, including all of the apartments built into project at the same time. When asked on the status of the retail component, Mr. Stovall said that the developer has received several letters of intent from supermarkets interested in the space. The problem, though, lies upstairs. 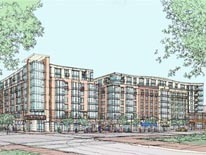 The banks, Mr. Stovall stated, are less convinced about the financial viability of building so many apartments on lower Georgia Avenue. U street developer JBG, however, has recently purchased several properties within a few blocks of the Howard Town Center site. JBG and Howard’s banks clearly differ in confidence in the area’s potential. Is Howard letting the perfect become the enemy of the good? Neighbors appear to strongly support the arrival of a supermarket, especially since the closest one, a mile away, offers a paltry selection. However, to abide by the banks’ requirements to reduce the number of units reduces the viability of the area’s retail revitalization. More residents, after all, means more potential customers, and thus more chances for success along Georgia Avenue. It’s certainly debatable as to whether the delay in the arrival of a grocery store is worth the slowing of Georgia Avenue’s revival. One the one hand, Howard’s desire for delayed gratification will make the avenue’s retail revitalization more durable. On the other hand, holding out for the ideal project postpones a catalyst for the avenue’s revival.